In a week where the once seemingly unassailable Barcelona conceded their first defeat in four years on their own turf and where Real Madrid were a goal shy from getting through to the final, there were some interesting aspects to pay attention to (please find the key to all the images at the bottom of the post). Let's move on to Barcelona vs Bayern Munich. The world will be (in fact, it already is) talking about the end of a cycle - which may or may not prove accurate, particularly given that Messi is still only 25. There is however another aspect that may not come across as critical, but which may turn out to be as important - to wit, the active role of the wingers in the defensive side of the game. Both Robben and Ribéry impressed with their work rate, with the French player effectively shutting down Dani Alves, one of Barça's main threats, over the two matches. With the previous day's example of Reus, Götze or Grosskreutz, the old adage according to which an attacker could not be bothered to defend, lest he became too tired to be decisive, could be on its way out. However, their decisiveness did not seem to affected at all, as the take-on chalkboard demonstrates. Barcelona were oddly at a loss when it came to dribble past opponents (largely because they were facing a very organised team), while Bayern's forwards often found pockets of space to sprint past their markers - chiefly the aforementioned Robben and Ribéry. Müller proved once again why he dubs himself the "engineer of space", not excelling in any particular aspect of the game, but always surfacing when and where the team need him. At Camp Nou, he was once again all over the pitch, tackling, overloading and helping control. Despite a more economical approach from the German team, Bayern were still able to create numerous chances, most of them following quick breaks in response to Barcelona's poorly coordinated attempt to press up front. 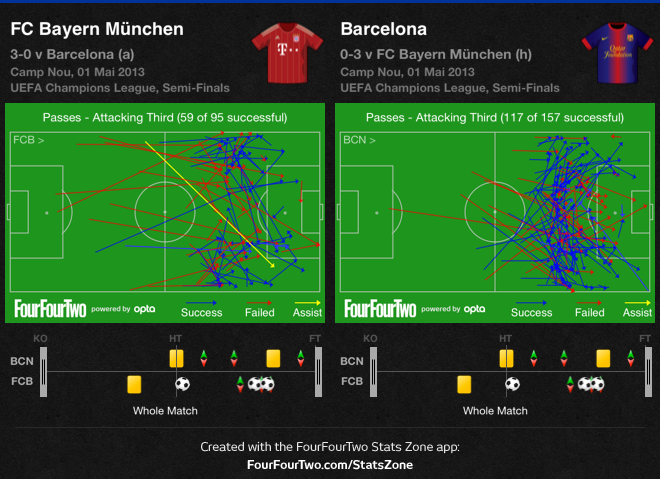 Notice how Bayern's chances in the second leg were the result of longer passes - unlike the previous leg, where their intensity allowed them to buzz around the box. As for Barça, despite all their efforts, this was not the display of a team of champions. While the number of interceptions may look high, it's actually more important to notice the absence of interceptions in the most important part of the pitch. Barcelona were forced to several last-ditch tackles and interceptions, precisely because the midfield could not provide the proper screening. 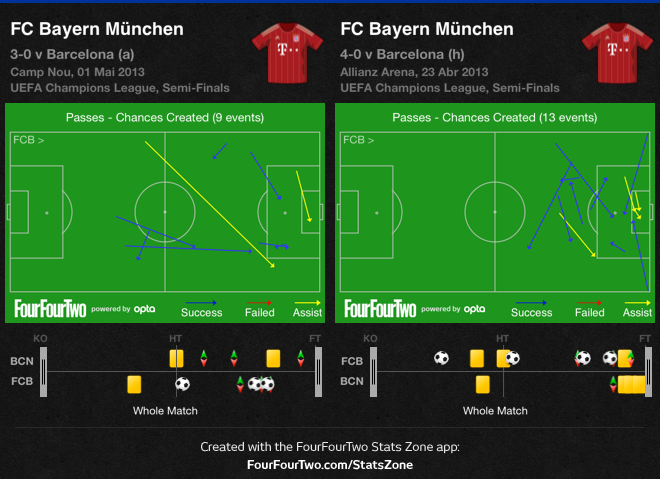 Bayern's chalkboard implies a more cohesive team, with a clear plan laid out. Barça's attacking play was not brilliant either, with Bayern forcing them to play square and backward passes and keeping them from playing their favourite diagonal balls through to Pedro or David Villa. Furthermore, giving the ball away cheaply meant that Bayern didn't even need to play a lot of passes in their attacking third to create all those chances. Therefore, it was hardly surprising to watch Barcelona struggle to muster a shot on target. The chalkboards of David Villa and Iniesta offer interesting evidence of Barcelona's difficulties. In the striker's case, notice how many backward passes he made throughout the match, apparently unable to get himself in decent positions. As for Iniesta, Javi Martínez's pressure was enough to smother the Spanish wizard's magic, forcing him to short square or backward passes as well, unable to dribble past opponents or find team-mates with through balls.